Nick Karavite Needs Your Support! A year ago, when he was thirteen years old, Nick was diagnosed with a rare blood disease called Aplastic Anemia. His immune system was attacking itself and his bone marrow was no longer producing any of the 3 blood cells: red, white or platelets. Nick needed a bone marrow transplant and the best treatment option was a transplant from a sibling. God answered our first set of prayers and given Nick his best chances with a perfect match in his younger sister Mandy, 6 years old. Nick’s transplant journey began with admission to U of M hospital, chemotherapy to completely wipe out his old immune system followed by transplant on Monday, August 4th. After almost a year of hospital stays, doctor visits, blood work, tutoring, physical conditioning and hard work, Nick is on the road back to a more normal life. He graduated in June and is looking forward to starting high school and sports this fall. Transplants are lifesaving but financially draining. 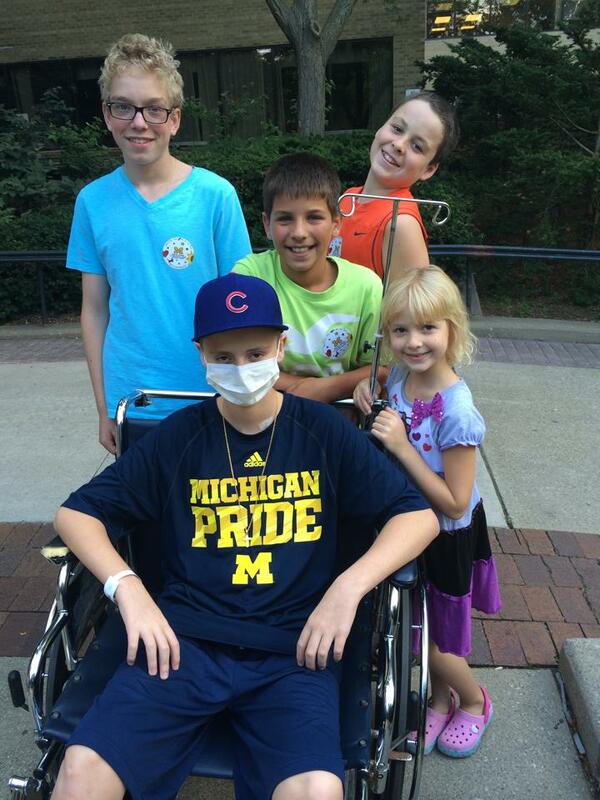 Even with insurance, the Karavite family faced very high out-of-pocket expenses including temporary relocation to Ann Arbor for the next 6 weeks during treatment and follow-up care, post-transplant immunosuppressant medications, co-pays, lab fees and tutoring expenses and more. There will be ongoing expenses related to the transplant. To help with the financial burden of Nick’s uninsured expenses, a fundraising campaign in his honor has been established with HelpHOPELive, a trusted nonprofit organization that has been providing community-based fundraising guidance to patients and their families for more than 30 years. All donations are tax-deductible, are held by HelpHOPELive in the Great Lakes Bone Marrow Transplant Fund, and are administered by HelpHOPELive for transplant-related expenses only. Please, consider a contribution. We cannot possibly ever thank everyone enough for the continued prayers and support; we have clearly progressed to this point because of God and all of you. We are sorry it has taken us so long to write; however, even though we are certain you already know how grateful we are, we wanted to make sure we thank each and every one of you for the difference you have made in our lives. As you know, Nick has been fighting Severe Aplastic Anemia for the past couple years. He has gone through exhausting and debilitating battles to stay alive and healthy, and he is doing exceptionally well with his body adjusting to the bone marrow transplant. When Nick was diagnosed, our dear friends set up the HelpHOPELive account on our behalf so our community could help us shoulder the financial burden thrust upon us with his sudden illness. Your donations not only helped us with Nick’s medical expenses, but also helped us relocate the entire family to Ann Arbor for Nick’s stay at U of M. Once the dust settled, we sought counseling to ensure our family adjusted well to our new normal, and our counselor informed us that one of the key factors in our getting through this ordeal so well, was the fact that we kept the family all together. We were only able to do that because of you. Thanks to you, we were able to focus on care for Nick, and the well-being of our other children, instead of costs associated with relocating, medications, co-pays, etc. You have become a force of hope and change in our lives through your extreme generosity. Your support kept this compassionate and courageous young man alive so he can someday give back to his community with his promise to pay forward your kindness. Thank you for everything, and God Bless You!! Nick update ~ Day +314 post-transplant ~ Nick’s numbers remain the same… Mandy 100% in two factions, Mandy 36%/Nick 64% in the final faction. DNA test again today, so we wait further results. In the meantime, nothing but positive things to report! Last year at this time, Nick was beginning to show signs of his illness, and as the summer progressed, there were a few times we didn’t think we would see this day; however, he graduated from the 8th grade!!! Nick is super excited to be moving on to Orchard Lake St. Mary’s Preparatory for high school!!! Honestly, there is no way he would be situated so well if it were not for St. Pat’s and St. Mary’s stepping up the way they did!! So blessed to be a part of this community. Additionally, Nick is playing travel baseball, and has started “strength and agility” training three days a week to get himself back into condition for high school baseball tryouts!!! We can not possibly ever thank you all enough for the continued prayers and support, we have clearly progressed to this point because of God and all of you!!!! I have to say, I thought Nick’s graduation would overwhelm us with tears, but all we felt was pure ELATION and GRATITUDE!! Thank you ALL!! Friends and Family ~ We just received a call from U of M with regard to Nick’s latest DNA results. Unfortunately, while Mandy’s cells are still 100% in two factions, the third faction is once again being taken over by Nick (70% Nick/30% Mandy). Nick’s doctor is putting him back on the drug they took him off of last week in hopes of turning the numbers around. I know you all have been praying and lifting us up with your thoughts, so please keep it up… I’m feeling pretty helpless and discouraged right now, and I need some help restoring my positivity. I never knew how much I could love until I had my children; equally, I never knew how much sadness I could feel until this past nine months. We are so very blessed to have the most amazing people in the world as a part of our lives, and I know this would be so much worse if we did not have such incredible support! Thank you!!! Nick update ~ Day +212 ~ Yesterday was a busy day for Nick at U of M. He started with blood work, had pulmonary function testing, his port removed, and finally a meeting with the Graft vs. Host doctor. All went well with his port removal, and we are thrilled to have it out. In our mind, the removal of the port signified Nick being cured and our being able to breathe a sigh of relief. According to the doctor, the cell count is still a concern. While they have a “few” patients that have had their own cells take over the donor cells and actually be good cells, it isn’t common. Since the steriods hadn’t worked as expected to encourage Mandy’s cells to take over, they are beginning a new approach. The doctor is decreasing the dose of the immune suppressing drug that Nick is on, which sometimes invites the donor cells to flourish. This option makes him susceptible to Graft vs. Host disease. We had thought we were out of the woods with regard to Graft vs. Host; however, the doctor said it was almost impossible for Nick to get it because his cells were still dominating. The fact is, when Mandy’s cells do take over, Graft vs. Host can show up. At this point, we have to be vigilant watching for the signs as it would be subtle, and is likely if Mandy’s cells begin to dominate. Additionally, we learned that the most common side effect for someone like Nick is skin cancer because of the chemo he had. For the rest of his life, he will have to be extremely careful in the sun, staying covered with clothing whenever possible. Hearing everything was a bit deflating just because we thought we were in the clear. With that said, it can always be worse. One thing that always hits me like a ton of bricks when we are at that hospital is the amount of sick children. We are so grateful for Nick’s progress, and we know it will only continue. As I listened to the doctor yesterday, something became clear to me for the first time… this is going to be a lifelong disease to manage. This amazing boy, as he listens to the same stuff, his response… “I’m so glad my port is out! Can I have a bagel? I’m hungry!” In that moment, I was thankful for his naivety, and feeling blessed that I can be the one to carry the burden of worry, allowing him to get on with his life. 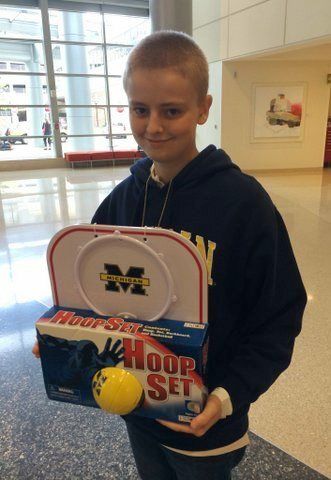 Nick update ~ Day +200 ~ The latest test results from U of M showed a “recovering immune system” for Nick! Additionally, the DNA test showed the cell counts holding steady with Mandy’s cells 100% in two factions and a 60% Nick/40% Mandy mix in the third faction. The consistency of the 60/40 mix result may just mean the cells will rest there for good. The doctor said Nick can live with the mix as long as his cell count doesn’t go up and overtake Mandy’s in the other factions. He has been completely weaned off the steroids, and that has helped tons with his mood, focus, etc. Nick’s Psychologist has confirmed that he is depressed, but that is normal for someone who has been through everything he has been through (having to be isolated for the past months hasn’t helped). Getting back into a routine, getting back to a normal life, will help combat this. All things considered, Nick’s doctor is going to let him return to school the end of March as long as there are no complications in the meantime. They are going to remove his port on March 6th which is huge! As of now, any fever earns him a hospital stay just because of the port, and fear of infection, so we are thrilled to get that out. Additionally, the move toward taking it out tells us that his doctor is confident we won’t need to use it anymore! Nick is feeling good, and we are now working on increasing his stamina, and shedding some of the weight he gained during the steroid therapy. We started daily swimming at the local high school, and he is feeling stronger everyday! This past weekend he had an AMAZING time! His school basketball team had generously given him a spot on the team (knowing he couldn’t play all season) and arranged a basket swap for the last league game (big thank you to St. Hugo for working with us and St. Pats for arranging), and it was nothing short of wonderful to see! Nick kicked off the game with some of his closest friends on the court. Tonight, he is excited to head over to St. Mary’s for registration/class selection! Watching this amazing young man step back into a normal life, so much to look forward to, gives me a smile I just can’t suppress!! Thank you so much for ALL the prayers and incredible support!! I just know things are going to continue down this positive road; but, even if there are a few more bumps, we shall sail over them because we have been blessed with all of you holding us up!! Nick update ~ Day +181 ~ Six month post-transplant U of M visit. DNA test today, and we wait. It will be a couple weeks before we know if Mandy’s cells have dominated, but my heart tells me she will prevail! They also drew blood to do an immune system test that will tell us when he can return to school and if we can lift restrictions. Those results should be within a couple days. Post-transplant eye check-up was today. The eye doctor said eyes look good; however, he was a bit miffed by Nick’s transplant team putting him on eye drops that cause cataracts in 1 out of 5 patients, so he may need surgery if that happens. Given we have the utmost confidence in Nick’s team, I’m sure they had a good reason for the eye drops, and we look forward to hearing that. Blood counts low (outside normal range), but that’s pretty normal right now. The good news… This boy is pitching and hitting as if he hadn’t missed a beat with regard to baseball!! This mama is looking forward to seeing her boy run the bases this season with a new found appreciation for every single step! God is Good!! Nick Update ~ Day +137 ~ Where to begin… Last couple weeks gave us a couple hiccups with regard to Nick’s recovery. First of all, in an effort to combat the effects of the steroids adding so much weight to Nick, he tried to eat healthy things such bananas and oranges. This, mixed with all the meds, caused his potassium to go up to dangerous levels leaving his doctor concerned about his heart. After a week of some pretty nasty meds, and trips back and forth for blood work, his potassium levels are once again back within normal range. Yesterday was a U of M check-up day. Last DNA report had given us positive results on the cells (Mandy 50%, Nick 50%), which was much better than the 80% Nick/20% Mandy that we had previously seen. As of yesterday, we are back at (Mandy 40%/ Nick 60%). Disappointment is an understatement. I really wanted to see Nick get off the steroids, but more than that, I was a little stunned the cell dominance shifted yet again. In three weeks, they will repeat the DNA test. Nick’s doctor said that if his cell percentage continues to go up, 70%, 80%, 90%… we will need to consider repeating everything, this time hitting the cells with a more severe chemo cocktail to kill the t-cells. I’m not going to lie, we are scared, and feeling pretty helpless. Yesterday, I left U of M feeling completely deflated, and feeling like we must do more than just wait for our next appointment. We are planning to take Nick to a holistic doctor and adding some things to his current treatments in the hope that we can keep this going in a positive direction. Please keep the prayers coming, they work! We are still very positive, and I plan on going into U of M in three weeks, Nick by my side with a slight feminine swagger because he has been overtaken by girly cells!! Friends and Family ~ Day +112 ~ Just around 6:00 this evening we received the news we were waiting for… Mandy’s cells are taking over!! Two of the three factions are holding at 100% Mandy-cells, and the third faction (T-Cells) are now at 50/50. Nick’s doctor (who sounded as relieved as we are) said this is exactly what he needed to see, and feels comfortable saying it’s “highly unlikely” we will need to repeat the chemo and transplant. Praise Jesus!! Our boy is on the road back to just being a carefree kid!! This relief will bring the first good night sleep in a long time!! Next DNA test in two weeks!! Thank you for your continued prayers and support!! Best Thanksgiving EVER this week!! Nick update ~ Day +87 ~ So, the percentages remained exactly the same. Nick’s cells 64%/Mandy’s cells 36%. There are three directions this can take. The remaining Nick cells could possibly be ‘good cells’ and that is why Mandy’s aren’t able to overtake them. If that is the case, Nick’s blood counts will continue to rise (which they did this week). The other two possibilities are (as you already know) Nick’s cells taking over and not being ‘good cells’ (forcing a repeat of the entire transplant), or Mandy completely overtaking Nick with her ‘good cells’. The doctor is now going to try cutting his steroid dose in half so we can see how this all plays out. He equated it to removing the muzzle from a barking dog. If we remove the muzzle, did the dog (Nick’s cells) learn anything from the correction? If they did, will they maintain stability (stop barking)? Will Nick’s cells realize that Mandy’s cells are in charge and be submissive? Or, will Nick’s cells come back barking, and take over again? With that said, we are kind of right where we were, but completely optimistic! The way I see it, there are three possible scenarios, and two of them are good! So we wait. Nick’s doctor will repeat the DNA test in two weeks, and we’ll go from there. In the meantime, they will keep a close eye on his blood counts. If anyone should see Nick, he has put on quite a bit of weight in the face and stomach due to the steroids; it will come off when the steroids stop, but he is a bit self-conscious. Finally, I can’t say this enough, Nick is such an amazing young man, and I marvel at his courage! There are times emotion just overtakes me, and I have to go somewhere and cry. Nick always seems happy and completely positive! He wakes up every day, full of strength, gives me a big hug, and with his sweet smile, asks the same question… “What are we going to do today, mom?” He is my Hero! Nick update ~ Day +61 ~ Before I get into the latest on Nick, I would like to say something. We have several friends that have lost children, and I want you to know that it is the first thing that comes to mind when I begin to post an update. It isn’t easy for me to deliver an update (particularly a positive one) when I know what you have been through and continue to go through. While I know that everyone hopes the best for Nick’s recovery, please know that my heart aches for you and your loss. Ironically, we did not receive the best of news this week. Nick’s numbers went up; however, as you know, two factions are 100% Mandy’s cells, and one faction was a 60% Nick/40% Mandy mix. The results this week reflected an 80% Nick/20% Mandy mix. A disappointment for sure, but we’ve decided it is just a hiccup in our journey. Nick has an amazing doctor, and he ALWAYS has a plan. He has added a couple meds to Nick’s current regimen… one that hopefully will suppress his cell growth, and one that will hopefully encourage her cell growth. It is a comfort to know that Nick can live with a mix of his/her cells in that one faction, but that means we need to see it plateau and remain at a consistent percentage mix. If his percentage continues to go up, his bad cells can take over. Please continue the prayers for Nick and our family. Seems we are beginning to feel the strains emotionally, everyone for different reasons. Normal for sure, but certainly not fun. So very grateful for EVERYTHING that people have done, and continue to do for us. We have amazing support, and certainly couldn’t get through this without all of you!! Nick Update – Day +41: Nick continues to improve. He caught a little cold earlier this week, which we assumed would put him in the hospital. After seeing his doctor and doing some blood tests on Thursday, they determined he had enough antibodies in his system to fight the cold himself, which was really good news. We’ve been spoiled with every report being well above the norm. There was one test that didn’t come back perfect. They do a DNA test to count how many cells are Mandy’s vs. how many are Nick’s. The hope is that all the new cells are Mandy’s, as Nick’s old cells are the ones that went haywire. They break the DNA test down into 3 categories. 2 of the categories were 100% Mandy, and the 3rd was 60% Mandy / 40% Nick. The doctor described this as a “yellow light”, not bad, but not good. The 3rd category were the T cells, which are the last ones to die off after chemotherapy. They run the same DNA test again in a couple weeks, and hopefully Nick’s percentage is dropping. Nick has been in really good spirits lately. We went to his football team’s game last night against St. Joseph Lake Orion. They drove the length of the field in the last 4:00 to win by 4, so that was exciting. Nick wants to go to Orchard Lake St. Mary’s for high school. He shadowed there last spring and loved it. Nick has done several sports camps there over the years, so they know him pretty well. 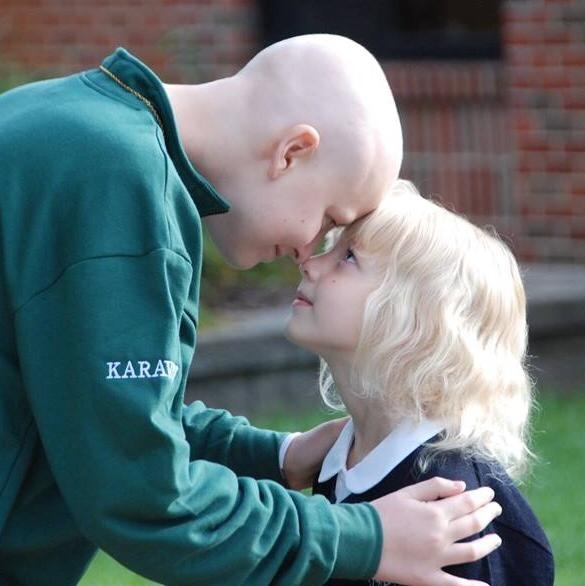 St. Mary’s has rallied behind Nick in an amazing way. They want him to do the coin toss this coming Friday at their Homecoming game, and there’s a tailgate party before the game for Nick’s friends and teammates. I’d like to extend the invite to anyone that might want to come out. Nick can’t mingle with everyone at the tailgate, but it’s going to be a big party. Nick Update – Day +22: We’ve been home for a week now, and we’re almost unpacked & settled after a month in Ann Arbor. Nick continues to progress, and we go to the hospital for outpatient blood counts and transfusions 2 or 3 times weekly. His Doctor is not comfortable saying any patient is out of the woods until Day +100, but every sign for Nick now is positive. Nick’s motivation in the hospital was to get home. Now that he’s home, it’s harder to find the motivation to do all the work that gave him such great results early on. It’s a marathon, not a sprint, but he’s going to put in the work necessary. So far we’ve avoided GVHD (Graft vs. Host Disease), so we’re very thankful that complication isn’t in the mix. Around Day +30, they’ll run tests to determine how many of his cells are Mandy’s vs. his old ones. In the mean time, Nick was accepted by Make a Wish, and his wish is a “Man Cave” in the basement. With the help of many good friends, we emptied the basement this weekend, and we’re putting the plans into high gear. Nick will have to be isolated for several months, so no better place to hang out than the “Man Cave”. We’re thankful for the many positive vibes and prayers on Nick’s behalf. The results of your prayers are obvious, so please keep them coming. 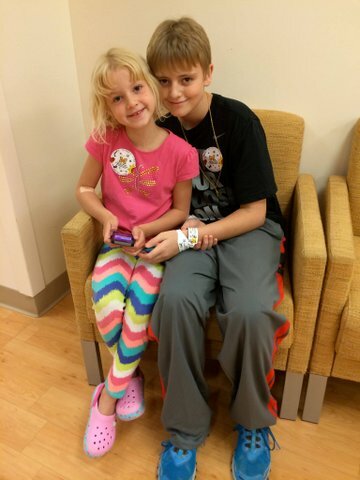 Nick update ~ Day +15… Nick’s blood counts continue to rise, and they are letting us go home today! Nick’s doctor was just in, and he said he has NEVER seen someone come back this quickly… “In a million years, I couldn’t imagine releasing somebody this soon, he is amazing.” Nick couldn’t be happier! We are a bit nervous as we will be on Rejection/Graft vs. Host Disease/Infection/Fever watch, but thrilled for our boy that he can be in his own bed, in his own home!!! Day +100 is when we should see his system back to normal, and his hair coming in. His doctors are truly amazed by his progress, and we couldn’t be more grateful!! The prayers, support, great doctors & nurses, and Nick’s hard work (not to mention the precise match of Miss Mandy), all contributed to getting him to this point. While we are aware Nick’s journey to recovery is just moving into the next phase with much work to do, we feel confident that he will overcome!! We’ve been able to maintain a positive outlook through everything for Nick, but as his numbers rise, the tears flow daily ~ an overwhelming release of relief! In the meantime, there are no words that can possibly express our gratitude to everyone. The special prayer services, fundraising, meals, visits, gifts, donations, housecleaning, plant watering, fish feeding, dog sitting, etc. We can’t even discuss everything that people have done for us without getting overwhelmed with emotion. Humbling to say the least. Please continue to pray for this incredible, inspirational, boy! He never gave up, followed all the instructions, maintained his kindness (even during the worst days and nights), and has forever changed our lives. uncomfortable. Today, I met a father who’s 9 year old daughter has a brain tumor that has spread to her spinal cord. She is undergoing a different type bone marrow transplant in the near future. Please include these courageous families in your prayers. Nick Update, Day +11: Nick’s doctors are “tickled pink” with how well he’s doing. Talk of discharge procedures are starting to whirl around CS Mott Children’s Hospital. He has already met all discharge criteria, except his white blood cell counts rising over 500 for 3 consecutive days. The white blood cells show up first, usually around Day +14ish, so we’re closing in on it. Nick was officially off IV nutrients as of Thursday morning. His dietician wants him to eat 2000 calories and 80g of protein each day. He’s averaging 140g of protein and God knows how many calories each day. Nausea has been gone for several days, and he’s progressing with his exercises and gaining strength each day. Your prayers are working, so keep ’em coming. The biggest obstacle in Nick’s future is Graft vs. Host disease or GVHD. GVHD could show up in the next couple weeks, so we’re hoping and praying to beat the odds once again. If Nick’s white blood cell numbers are up next week, he could be home as soon as Aug. 22. Homecoming will be a happy day :-). Nick & Mandy Update ~ Today is Day +8 of Transplant. Nick is doing really well. Per his doctors, he is the “Poster Child for what good transplant progress looks like”. He doesn’t always feel that way as it is still early for his blood co…unts to come up on their own, and he still requires transfusions now and then. Last night he didn’t sleep because the pain in his legs and feet was excruciating. However, this could be an early sign that his sister’s cells are beginning to grow. His hair began to fall out this morning, but he knew it would happen, and he seems okay with it. They are starting him on meds to stimulate his sister’s cells today. This requires one shot a day, and he is REALLY upset about that. Mandy is doing well with just a couple bruises on her lower backside. Just for fun… One of Nick’s nurses taught he and his buddy Max (and Mom & Aunt Kathy) how to do armpit farts with a straw. We had a great time wreaking havoc in the elevators last night with our new trick! I haven’t seen him laugh that much in a long time! Keeping it classy in Ann Arbor!! Keep up those amazing prayers and good thoughts, it is working!! We’re happy to report 2 good days of continued appetite for Nick both Saturday and Sunday. The eclectic menu continues, highlighted by many selections from Dunkin Donuts. As a twist today, he ordered Thanksgiving dinner for lunch. At least he’s moving towards more normal foods. Nick’s doctors are very happy with his progress. Everything he’s experiencing is normal. It’s so nice to not see him suffering as he was last week. He’s not out of the woods yet, but we’re praying to avoid the possible complications that still might arise. Nick has had some great visits from his core buddies, and his homeroom teacher for this year, Mrs. Beans. These visits have really lifted his spirits. The Dusang’s brought him an autographed Alex Avila bat, and he may get a visit from the Tiger catcher. Nick is very grateful for all of the continued love and support. Nick update ~ Nick had an excellent day today! He was feeling good, enjoyed some visitors, and even went for a long walk/ride OUTSIDE! He began eating again around 4 p.m. after a medication was introduced to stimulate his appetite. His choices… White Cheddar Popcorn and a giant Kit Kat bar, but we are not complaining! Nick and Mandy update… Day +2 of transplant ~ Mandy is doing fantastic! She said it was easy, and would do it again if she needed to (let’s hope we don’t need that)! She is amazing!! As for Nick, it will be three weeks before we know if the transplant was successful. Somehow, I thought we would be able to sit back and just watch him improve day to day, but that isn’t going to be the case. The side effects of the chemo are still present, and there are many hurdles we must watch for post-transplant. Nick hasn’t been able to keep any food down since last Friday, and is now being fed nutrition via I.V. He continues to have blurred vision which is frustrating to him, and he had a bad reaction to a med today that caused muscle spasms in his arm and neck. He wakes up positive, but as the day progresses, he seems to get more and more depressed. He is trying to do everything that is expected of him so he can get well and get out of here, but he doesn’t always have the energy. Hoping and praying for a better day tomorrow! Thank you all so much for your continued prayers!! We do not know what we would do if it were not for all of our amazing friends and family!!! Mark’s Facebook update on 8/5/14: After another long, but successful day, we thought we’d give you a behind the scenes look into a bone marrow transplant. Here’s Nick getting hooked up, and the first stem cells from Mandy infused into Nick. It’s uneventful, and beautiful all at the same time. It wasn’t quite the Hallmark moment I had envisioned. Mandy required pain medication, which she wouldn’t take, so we had to hold her down and force it into her. That was the 2nd time today I had to hold my baby girl… down while the medical staff force fed her meds. Nick was not feeling well from chemo side effects, so he and I butted heads. First about repositioning himself to help the transplant start running, then regarding the unpleasant chores he must do to avoid further complications. After the transplant was done, a bout with muscle spasms, and more chores, Nick agreed to go for a walk around the hematology ward. We walked up near the elevators to say goodbye to the rest of the family. The hug between Nick and Mandy made it all worth while. One of the most beautiful moments of my life, just a few minutes after some of the most stressful. After saying goodbye, as we walked the halls, we ran into another bone marrow transplant patient named Ryan (Nick’s middle name). Ryan is 19, has cancer, and is on day +11 after his transplant. This young man told Nick everything I had been preaching, which frankly Nick was tired of hearing from me. It’s like God put Ryan in that hallway to give Nick a message of hope, and commitment to doing the right thing. We’re very thankful that Mandy is fine and resting with Pamela, and Nick is doing great, and Dad and Nick have found a deeper understanding of each other, and what we both need to get through this together. Now it’s back to the chore of staying healthy while we wait anywhere between 16 – 21 days before the blood counts start to come up on their own. Nick is in the home stretch of his Chemotherapy. Today is the last of 4 days. He’s bravely endured 3 days of a combination of chemo and another medication called ATGAM. The ATGAM has worse side effects than the chemotherapy, so we’re glad he finished that yesterday. It has been a rough few days, but no matter what, Nick does exactly what the doctors have asked him to do. It’s very hard, but it will help him in the long run. Sunday is a day of rest (as the good Lord intended), and the transplant (Nick’s new 2nd birthday) is Monday. Mandy comes in early in the morning for her part of donating the bone marrow, and we’ll all watch Mandy’s bone marrow infused into Nick in the early afternoon. Nick’s doctor said it’s both uneventful (as it’s much the same as a transfusion for Nick) and momentous at the same time. We can’t thank all of you enough for your prayers and support. Just when Nick (or Mom & Dad) are feeling low, someone reaches out with more amazing gestures of love and support. God Bless you all. 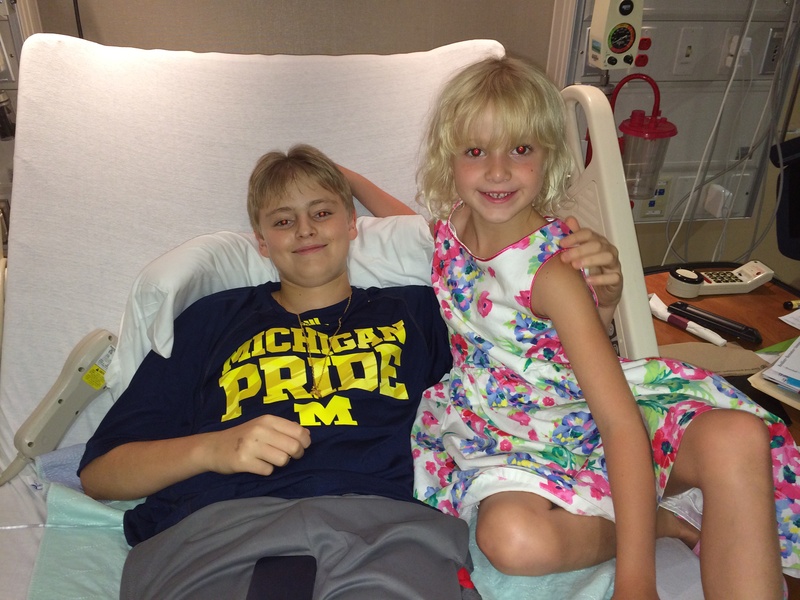 Nick update… Today Nick and Mandy received the blessing from our doctor at U of M to go ahead as planned. Last week offered some hurdles; however, the outcome was great on all accounts. Mandy’s blood counts are normal as of Friday, Nick…’s sinus fluid was not an infection, and, although Mandy is a ten out of ten match in terms of antigens, if her blood type didn’t match Nick’s as well, it would have offered some challenges with regard to the transplant… her blood type came back the same as his. Nick checks in to U of M tomorrow, and his chemo begins on Wednesday to completely wipe out his old immune system. Chemo will be Wednesday through Saturday, Sunday will be a day of rest, and Monday, the 4th, will be transplant day! Please pray for Nick as chemo week will be the toughest week he has faced thus far. Please also pray for Mandy as she steps up to give Nick this amazing gift! Since Mandy’s birthday is June 30th, we found a restaurant willing to give us a private room tonight (as Nick cannot be in crowds) so we can celebrate as a family. Nick is thrilled to be going out to dinner before going into the hospital for his extended stay. Again, we can’t possibly thank EVERYONE for the prayers, meals, cards, visits, gifts, and support!! We are so very blessed to have such incredible family and friends! This would be so much worse without all of you backing us in this fight!! In the end, Nick (all of us) will have the greatest gift… An appreciation for life and how fragile it can be. Nick update…This week has been filled with tests for both Mandy and Nick essentially clearing our path to transplant day. It is a roller coaster ride of waiting daily, which can be super frustrating for all of us. As of now, we are waiting on genetic testing to return ruling out any chance of Aplastic Anemia being in our genes. If by a small chance it is, Mandy would need to have further tests before she would be able to donate her bone marrow to Nick. Additionally, a CAT scan showed fluid under Nick’s cheekbones. The doctors need to extract the fluid, test to figure out if it is a bacterial infection or fungal infection, and treat it accordingly before he can begin chemo next week. This would typically be a simple procedure; however, because of Nick’s condition, it must take place in the operating room so they are prepared should he bleed which is dangerous for him. He is in surgery right at this moment. Additionally, Mandy’s blood work on Monday showed that her Neutrophils (type of white blood cell) are low, so she will require further blood work on Friday before she can be cleared as Nick’s donor. Now… on to the fun stuff! U of M has a wonderful staff of social workers, which really helped make Mandy’s day more fun on Monday and less like preparation as a donor. With her doctor’s kit in tow, they gave her a doll to work on while showing her everything she would be going through on transplant day. At the end of the day, dressed in her newly acquired accessories, she came up to us and said, “Hello, I am Dr. Mandy and I get rid of all your problems, and clearly you have some!” LOL It was a wonderful moment that made us all laugh. Nick gave her a big hug, and you could just see that these precious few days have showed him that the gift she is giving him is given completely out of love and not obligation. Nick update ~ Nick’s time at home has completely lifted his spirits. He has been able to remain fever-free, and the transfusions every couple days sustain him. This coming week he and Mandy will undergo many tests out at U of M preparing for the transplant. Nick’s chemo will begin the week of the 28th, and the transplant date is set for August 4th. They refer to this as Nick’s new “birthday” since his entire immune system will be just as it is for a newborn. Since his actual birthday is Christmas day, he loves that he’ll have a second birthday to celebrate. Mandy is ready to go, and understands her role is that of “Helping” Nick. We have explained that she has just one of the many medicines Nick needs to get well. We really are trying to downplay her level of help as it is really too much to lay upon a little girl. If and when you see her, please stay away from phrases like “you are saving Nick’s life”. On the less serious side, she has been quite funny. Yesterday, she asked me for something. When I said “No”, her response to me was, “but I’m the donor!” (while tilting her head and blinking like crazy) LOL I whisked her up in my arms, we laughed, and I told her that wasn’t going to work for her. She thought she was pretty funny! We can’t thank you all enough for EVERYTHING that people have done and continue to do for us! There is no way our family could get through this without ALL the amazing support we are receiving from family and friends!! Please keep the prayers coming as Nick’s journey has only just begun. We should know by about the 18th of August if the bone marrow transplant did the job as we should begin to see a rise in his numbers. He will be in U of M for at least six weeks as they watch closely for rejection or any other complications. Once he is released, he will be home and out of school, church, etc., until at least January. Finally, Mandy’s 6th birthday is July 30th. In an effort to keep things normal, we would like to still have a birthday party for her. If anyone knows of a really cool kids birthday spot somewhere between Ann Arbor and Waterford, please let me know! Hello friends. Many of you have already heard, but in case you haven’t, our oldest son Nick (13 yrs. old) was recently diagnosed with a rare blood disorder called Aplastic Anemia. Basically, his immune system is attacking itself, and his bone marrow is no longer producing any of the 3 blood cells: red, white or platelets. The best treatment is a bone marrow transplant, and preferably from a sibling. We had all the kids tested for donor compatibility last Thursday. We’ll know (hopefully) by the end of this week if any of them are a match. Please pray for a sibling match, and for Nick to stay away from infection between now and when his treatment starts. Nick is in very good spirits, and he knows this disease is treatable, and we’re going to beat it. The outpouring of love and support from our family and friends has been overwhelming to us, and more helpful than anyone can know. My wife Pamela has shown us amazing strength throughout this process. She was already a SuperMom, and she’s putting her previous accomplishments to shame lately. I’m so proud to call her my bride, and yesterday was our 14th anniversary. It’s not exactly how we planned to spend it, but I’ll take it any day. I can’t imagine how our family would hold together without her strength. Our pediatric bone marrow transplant specialist at U of M Mott Children’s Hospital today said that he knows Nick is going to be fine, because his Mom is going to make sure of it. Damn right Doc!! Nick and Mandy on the day we found out she was a match. Nick, I collected $150 in donations today for my birthday wish to support your fundraising page! The donations are from all your 8th grade classmates that are praying and supporting you to keep up the good fight!!! Nick, I am going to Peter's birthday party today and, in lieu of a gift, Mrs. Dankelson asked to donate in support of your cure and wear our #NickStrong shirts. We're all praying for you. So happy to read that you are doing well. Every day you will get better and stronger and we know this because of all the prayers, wishes and positive thoughts that everyone is sending your way. Hey Nick, I'm thinking about you and praying for you and your family. Stay positive, you'll beat this! God bless! Maddy and the rest of the Brzezinski family would like you to know, you are in our prayers. We all hope you are better soon. If there is anything we can do to help out the family during the school year, please feel free to let us know. As someone who worked in an Oncology-Hematology office, I can tell you, keeping a positive attitude is very important. My best advice is this... When you're feeling the worst, and think you cannot endure another treatment, just smile and remind yourself, you're going to kick this thing right in the ......... (insert your own word here, ). Hope you're well enough to see you on the 18th at Zapzone. Nick we know you've got this! Hang in there. Lots of prayers and love from the neumann family. Nick, my thoughts and prayers are with you, Mandy and your entire family. Stay strong and god bless. Nick, we are praying for your recovery and strength. We heard about you through Mrs Beans. She was my sons favorite teacher at St Pats. He just graduated from orchard lake st Mary's. It won't be long before you are making your high school plans! God speed! Keep smiling Nick! Almost there! We are thinking of you and praying! Nick- You are one of the strongest kids I know. I am always thinking about you. See you soon! Nick, if you are as strong as you are good lookin- you got it made ! Dan and all the McCarthys are rootin for ya ! Nick, You are so strong....we are praying for you all the time....love you bunches. Nick, you and your family are in my prayers. Happy birthday to Mandy! Amazed at your great strength Nick! Everyone at St. Pats is praying for you! We love you! You've got this! Happy birthday to that awesome sister of yours! I hope today went as good as possible. And a happy birthday to your sister, Miss Mandy!